It's natural enough to want to read more about the Maya in 2012, as the end of their Long Count calendar fast approaches. James O'Kon's timing with the release of this new book may be coincident with much hype about the End of the World, but this book has definitely got both of its feet firmly on Terra Firma. The author is an engineer by trade, and is a passionate explorer of the ruins of the Yucatan in his spare time. He brings his professional knowledge firmly to bear on the ruins of the Mayan civilisation, and the surprising levels of technology that went into making them. This analysis makes for a fascinating text. It breaks new ground scientifically by establishing the use of relatively technologies by this ancient people that archaeologists had only dared to imagine. Unusually for a popular science book in the alternative genre, the book has been peer-reviewed and supported by various academics interested in the Maya. Such a cross-over is welcome, and offers the more contentious content of the book an unofficial nod of academic approval. The book focuses on the Classical Period of Maya civilisation, between 250AD and 900AD, which was more advanced that the contemporaneous European civilisations of that time (not too difficult considering this was the Dark Ages here). The environmental challenges of living in the Yucatan peninsula required innovative technological solutions - the Maya needed to overcome the dual difficulties of a stop-go rainfall pattern throughout the year, combined with the porous nature of the limestone rock the entire area sits upon, which drains away precious surface water. Curiously for a rainforest area, the Yucatan spends half the year in drought conditions. So the storage of vast quantities of potable water was essential to maintain the basic living requirements of 15 million Maya at the ancient civilisation's peak. The Maya achieved the kind of civil engineering feats that we normally associate with the Romans, or even the renaissance towns of Europe. Yet, mainstream archaeology depicts the Maya as a Stone Age people. Technically, they were - simply because there was no metal ore available to them to ascend the scale of implement use from stone to bronze to iron, so necessarily they fall into an academic pigeonhole that simply does not do them justice. Rather than shaping metals, they crafted ingenious tools from jadeite and obsidian, which are stronger than steel. Work done by Philippe Klinefelter (described in this book in some detail) greatly enhances our knowledge of Mayan tool-making and use, and should allow archaeologists to consider the mysterious artefacts in their museum collections with a fresh perspective. O'Kon provides a potted history of the Maya through the book, creating context and perspective in equal measure. He reproduces some very old illustrations of the ruins in Guatemala and enhances the book greatly with some excellent photos and technical drawings of his own. The book is evidently a labour of love for a true Mayaphile. When he moves towards the building of Mayan monuments he then really steps up a gear. It is the language O'Kon uses to describe these technological achievements that works so well to refresh our understanding of this ancient people. He describes what they built using vocabulary one would expect in a modern civil engineer's report. It's a simple linguistic trick, but a very effective one nonetheless. One immediately gains a new respect for the ingenuity and organisational ability of this 'Stone Age' people. Where the limestone on the Yucatan creates a huge problem with water drainage (and the commensurate lack of running fresh water via any kind of real river system) it lends itself to the manufacture of cement and concrete. O'Kon aptly demonstrates the use of Mayan kilns to create these artificial building materials at high temperatures, making use of the ample supplies of readily available timber in the area as fuel. This harvesting and storage of rainwater, combined with a simple but ingenious filtering system, provided the resource necessary to enable modern urban living in the Yucatan in the form of high-density housing and intensive agriculture. These successful city states traded with one another using sea-faring boats and a remarkable road system designed to overcome both the elements and the continually encroaching rainforest. The author perhaps delved into the wonderful 'sacbe' roads in too much detail, allowing his professional interest to render the book into a technical manual in places. A more authoritative editor would have insisted on shifting chunks of O'Kon's (albeit excellent) survey work into an appendix. Unfortunately, the abundance of typos in the book indicates this literary labour of love was insufficiently tidied up generally. Towards the end of the book we are treated to O'Kon's major contribution to the study of Mayan civil engineering. During an eventful field trip to the ancient ruined city of Yaxchilan, he surveyed the remnants of a curious series of stone and concrete platforms in the omega-shaped river there, reduced essentially to piles of rubble. He quickly realised that these were the remnants of supports for a uncompromisingly long-span suspension bridge. The bridge's existence solved the riddle of how the city managed the 6-month period when it would have been cut off by flood waters during the rainy season. In a masterful piece of research and deduction, O'Kon recreates the architectural design of the bridge from the clues obtained in his field surveys and aerial photography. As a result, our appreciation of the technology of this once great people is lifted to an altogether new level. Describing the mysterious fall of the Mayan civilisation, the author argues that this system then proved unable to cope with extremely long periods of drought. The Mayans lost vast swathes of their population due to climate change, and an inability to adapt when the rains consistently failed. All this, it seems, despite their good trading links and sea-faring abilities. He paints a picture of a stranded people living in a 'geographic vacuum' falling to their knees and dying in droves. This seems over-dramatic for such a long-term crisis. More likely, the majority of the population emigrated to other lands, with whom they already had trading links, leaving the once great cities as empty shells inhabited by a brave rump of hardy folk who then regrouped into a more transient, tribal network. The collective memory of how to successfully achieve urban living had been lost, leaving the empty, overgrown cities as a monument to a time when science had been defeated by the wrath of the rain god. 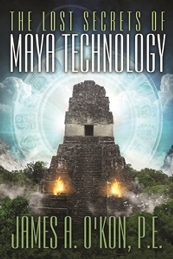 I thoroughly recommend this magisterial contribution to our understanding of Mayan technology and science.